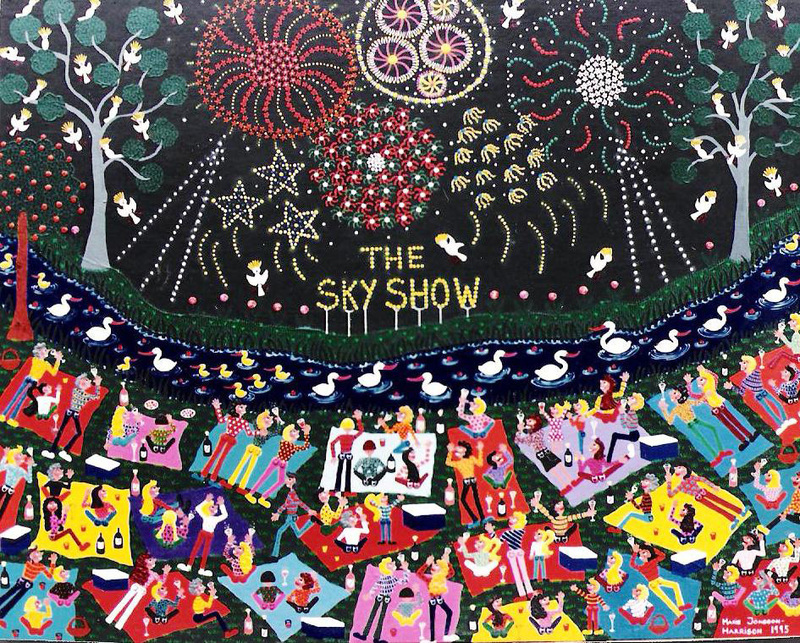 We first started going to the sky show when our son was about 10 months old in 1988 and that is the inspiration for this naive art painting. The Sky show was held as an annual event and started in the middle 80’s to celebrate Australia Day with an amazing fireworks display synchronized to pop music and sponsored by a local radio station called SAFM and later on joined by the hardware store Bunnings. It was held in Bonython Park along the river and attended by an estimated 150.000 people at a time, but watched by many more from several vantage points in Adelaide, it was of course with my artistic eye a painting just waiting to happen! We actually tried to watch it one year when we were unable to go from the farm 100km away, but that proved to be a tad optimistic!! Every year we would pack a picnic and drive the one and a half hours into Adelaide park the car and then walk along the river for another 20 or so minutes to reach the spot with bags and picnic blankets, esky and with the kids in tow, together with what seemed to be the entire Adelaide population. With the atmosphere of anticipation in the air we would make our way along whilst the kids ran up ahead and one year even brought their scooters (you know the kind without a motor that you kick along with your leg on the ground) that they got as Christmas presents and whizzed up ahead. 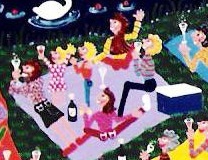 Our son Kai (red top & blue jeans on painting detail) as I said was only a baby when we first attended and we were a bit worried that he would be frightened by the noise of the rockets going off and the loud music, but no worries, he was good as gold and just laid there with me on a big picnic blanket looking up at the sky with the biggest of eyes, our daughter Hillivi (pink dress with hearts on painting detail) was much the same 4 years later when she came into the world. We would set ourselves up in a particular spot each year far away from the stage but right by the river, where the kids could run around and chase ducks and play after which we would have an amazing feast of dips, crackers, olives and the like, followed by a “main course” of sorts and cake and coffee. As you can see from this Japanese art invitation I was in rather good company in this exhibition-just the 3 of us! Being part of an art exhibition featuring art by Andy Warhol and Steve Kaufman is something you as an artist just dream about! 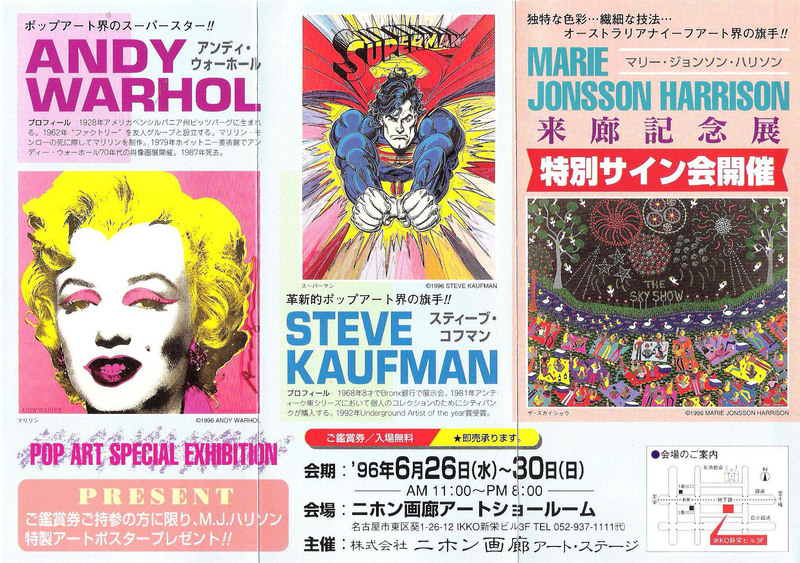 With Andy Warhol & Steve Kaufman, artist Marie Jonsson-Harrison is in good company! Lying there next to the river watching the wonderment of the black sky with the stars followed by pulsating music and then the crack and light explosion of a million rockets going off and tumbling down all over the sky was amazing – You know how sometimes you feel the godliness (whether you are religious or not) when something stirs deep inside you and you have your loved ones close and you just want to capture that feeling forever, well that was the sky show for us.